Do you know Georgia’s 12 hummingbirds? Green Violet-ear – This species has been reported from time to time in Georgia, however, only one record of the species has been accepted by the Georgia Ornithological Society. This bird was sighted in Thomasville. The green violet-ear ranges from central Mexico southward through Nicaragua, Costa Rica, Panama, Venezuela, Columbia and Ecuador. Green-breasted Mango – This species has been documented only once in Georgia. It can be found from Mexico southward through Belize, Honduras, El Salvador, Nicaragua, Costa Rica, Columbia and Venezuela. In the United States, the bird has also been located in North Carolina, Texas and Wisconsin. Broad-billed – This species is an accidental winter visitor to the Peach State. Broad-billed hummingbirds breed in southeastern Arizona southward to southern Mexico. Although this species typically winters in Mexico, it has also been sighted in such places as South Carolina, Alabama, Mississippi and Louisiana. Buff-bellied – This species has been documented only once in Georgia. Its breeding range extends from the Yucatan Peninsula northward to Texas’ central Gulf Coast. The bird has also been seen in Arkansas and Florida. Magnificent – This bird has been seen only twice ( St. Catherines Island and Winder) in Georgia. This large hummingbird breeds in the mountainous regions of southern Arizona and southwestern New Mexico southward to Central America. Each year a few of these birds seem to wander widely. Reports of magnificent hummingbirds have also cropped up in Texas, Arkansas, Utah, Wyoming, Nevada, Alabama, and Colorado. Ruby-throated -The ruby-throated hummingbird is a common spring and summer resident here. It is the only species of hummingbird known to nest east of the Mississippi River. It nests throughout the state. Most rubythroats leave the state by the end of October. The majority of the ruby-throated hummingbirds seen in Georgia during the winter are spotted along the Georgia Coast and in Thomasville area. Most ruby-throated hummingbirds winter from western Mexico and as far east as Panama. Rubythroats return to Georgia as early as late February in Southwest Georgia, however, most of us don’t see our first rubythroat of the spring until middle to late March – April. Black-chinned – This species is a rare winter visitor throughout the entire state. The breeding range for this species extends from southwestern British Columbia as far west as Texas. Anna’s – With fewer than 10 reports of this species being seen in the Peach State during the past 50 years, Anna’s hummingbird is considered an accidental winter visitor here. The breeding range for Anna’s hummingbird includes the states of Arizona, California, Washington and Oregon. This bird winters along the Pacific coast from Washington to northwest Mexico. It also winters in Arizona. Calliope – The calliope hummingbird is the smallest bird in North America measuring only 2 3/4 – 3 1/4 inches long. This petite hummingbird is an accidental winter visitor throughout Georgia. The calliope breeds in the mountains of central British Columbia and southwestern Alberta south to northern Baja California. Calliopes normally winter in Mexico. Broad-tailed – The broad-tailed hummingbird is another western hummingbird that is an accidental winter visitor to Georgia. Broadtails breed in east-central California and Nevada north to Montana and Wyoming, as well extreme western Texas and Mexico. This species winters from central Mexico southward. Rufous – The rufous is considered an uncommon winter visitor throughout the state. It is the most commonly seen hummingbird seen in Georgia during the winter. There are typically at least 50-75 reports of this bird in Georgia annually. The rufous hummingbird has the northern-most breeding range of any hummingbird. Its breeding range extends from southern Alaska through Washington, Oregon, western Montana and northern Idaho. It winters throughout much of Mexico. However, the rufous hummingbird wanders more than any other hummer. It has been reported from all of the states east of the Rocky Mountains as well as most Canadian provinces. Allen’s – This bird is an accidental visitor to our state. Allen’s hummingbird breeds along the California Coast and winters in Mexico. The moth seen in this photo was found by my wife Donna in the grass at our Monroe County home one afternoon shortly after a spring shower. It is known as the confused eusarca. it is one of the many small moths that fly about Georgia backyards from April to October. Measuring a little more than an inch from wingtip to wingtip, at first glance it may appear nondescript. However, if you closely examine this moth you will find that the dorsal side of its tiny almost white to yellowish tan wings appear to be sprinkled with extremely small bits of grayish brown dust. Larger black dots (discal spots) are also present on the wings A thin, straight brownish line (that entomologists call the pm line) runs across the wings. This line makes a turn or seems to disappear near the tips of the wings. Confused eusarca caterpillars eat a number of plants that commonly grow in Georgia yards such as clover, goldenrod, asters and dandelions. If you want to better see the wing pattern displayed on the wings of this small moth, look at it through a pair of close focus binoculars or photograph it with your digital camera or cell phone. When you increase the magnification of the picture, the delicate wing pattern will seemingly magically appear. It is always a delight to see a rose-breasted grosbeak feeding at a backyard feeder. However, the vast majority of us only see this bird as it passes through our state on migration during the spring and fall. Sadly, during some years rose-breasted grosbeaks are common diners at our backyard feeders, while in other years they are no-shows. From the reports that I have received this year, rose-breasted grosbeaks have not been seen by most homeowners. The adult male rose-breasted grosbeak is one of the most striking birds that visits our backyards. 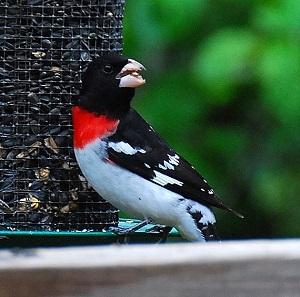 The adult male is predominantly black and white and sports a bright red triangle on its breast. If you are lucky enough to see the feathers on the undersides of its wings you will discover that they are pink. The female rose-breasted grosbeak is brown and white and looks much like a super-sized sparrow. During its first fall the young male rose-breasted grosbeak looks much like a female with a blush of red on its breast. This is the basic recipe, other ingredients such and pieces of peanuts or nuts, grits and the like can be added, if you like. Use your imagination, you just might discover that your ingredients make the bird butter even more attractive to the birds. Melt both the peanut butter and lard over low heat. Pour the melted peanut butter/suet mixture into a mixing bowl. Stir in the thoroughly mixed dry ingredients and pour into a cake or cupcake pan. If you pour the mixture into a cake pan, score the mixture with a knife so that each segment will fit into your suet feeder. Freeze the ingredients. Once frozen, the scored sections can be easily separated and placed in an inexpensive rectangular-shaped suet feeder. Freeze the remaining suet until needed. Here is a list of some of the birds that are known to dine on bird butter: Carolina wren, downy, hairy and red-bellied woodpeckers, northern cardinal, common grackle, northern mockingbird, brown thrasher, eastern bluebird, ruby-crowned kinglet, yellow-rumped, orange-crowned and pine warblers, house finch, Carolina chickadee, tufted titmouse and chipping sparrow. 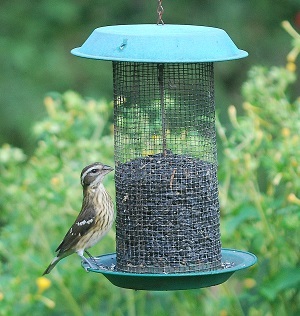 Don’t be afraid to feed this suet in the summer. This suet seems to resist melting more than many types of suet. Although pedestal birdbaths are great devices to provide birds with water, they can be dangerous to cats, dogs and humans alike. All to often when a cat or dog tries to drink from one, or a curious child grabs the edge of the heavy cement basin, it comes toppling down. When our two family cats knocked the basin off its pedestal several times in a single month, I began searching for a solution to this problem. I decided that I could either sit the basin directly on the ground or mount it atop something more stable than a heavy, slender column. I decided to place the cement birdbath atop an old planter. The wide top and base of the planter proved to be far more stable than the pedestal. 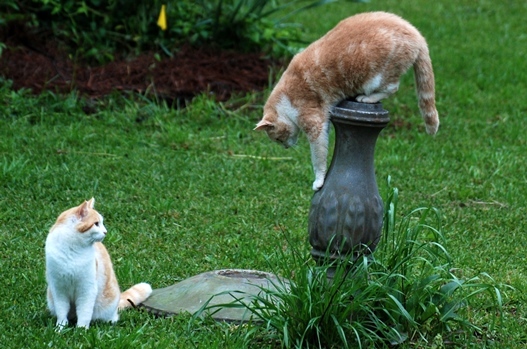 Since I have discarded the cement pedestal in favor of a planter, our cats have not knocked it off the perch a single time, in spite of the fact that they seem to drink water from the birdbath on a daily basis. 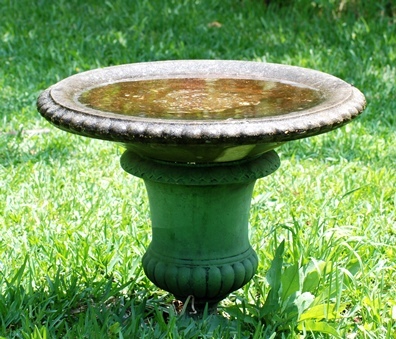 If you currently use a pedestal birdbath in your backyard and want to reduce the chance of injury to your pets, children or grandchildren, give it a try.